Secondly, if there is not agreement on a ‘new improved framework’ for dealing with parades before the end or March there is no guarantee that the resolution scheduled for March 9 agreeing to transfer policing and justice will pass. Therefore, the working group to be jointly chaired by Peter Robinson and Martin McGuinness, which begins work on Monday, is critical. The truth is that unionists got nothing on parading, so negotiations will continue for another three weeks at least. Sadly there was little sign at yesterday’s formal announcement of theagreement that the first crucial aspect would be honoured by the DUP. In his excellent speech which quoted paragraph two and expanded on it, Martin McGuinness referred a couple of times to “Peter” . The DUP leader in typically dull, pedestrian remarks resolutely stuck to “the deputy first minister”. He also refused to shake hands on the deal. So much for the spirit of mutual respect vital for the success or devolution. There is much in the detail about parading, which those in the OUP who voted against the deal last Monday, will find abhorrent such as “local people providing local solutions”, “respect for the rights of those who live in areas through which they seek to parade”, “a code of conduct which is legally enforceable”. In short, the prospect of even more detailed rules governing parades. Finally the bottom line that the Parades Commission remains in force until any new arrangements are agreed. Agreeing those new arrangements before the end of this month is a tall order. Nevertheless the DUP assembly group has signed up to the agreement, which is in itself a first since they never signed up to the Good Friday Agreement or the St Andrews Agreement, except the bits of the St Andrews Agreement they liked. Let’s watch now how they implement an agreement they’ve signed as opposed to ones they set out to sabotage. 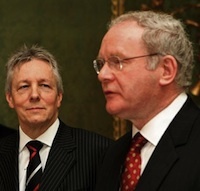 The positive driving force here has to be Peter Robinson but there’s little sign he knows it. His talk about a cunning plan to thwart the agreement is not helpful. If he fails to provide resolute leadership as he has so far he will go the same way as Trimble. For a start he has to take on the truly pathetic dog in the manger Sir Reg never-to-be-Mp Empey. Here is a golden opportunity to sell the Hillsborough deal and totally flatten the hapless Empey who deserves utter contempt for his attempt at political opportunism. If Robinson doesn’t take his courage in both hands and lead from the front his neanderthal MPs will come at him again in the next month. Last Monday night’s mutiny weakened Robinson but paradoxically Empey’s cheap move may strengthen and unite the DUP. Robinson should turn Empey’s serious tactical mistake from a limp-wristed challenge into an opportunity to show who leads unionism, not Allister or yesterday’s backwoodsmen like Willie McCrea and Gregory Campbell but someone who is not afraid to talk about fairness and equality, words that unionists have been loath to utter. Has Robinson the strength to show that cooperating civilly in public with Martin McGuinness doesn’t mean he’s selling out?